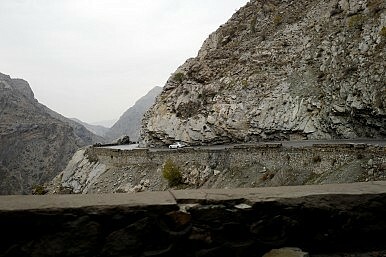 Security threats on the Kabul-Jalalabad highway have drastically increased over the last few weeks. The Diplomat’s Franz-Stefan Gady is currently in Afghanistan reporting on the ongoing war against militants in the country. On the last stretch of our early morning drive on Highway 1 from Kabul to Jalalabad we come across a peculiar site: A haulage truck, more than crammed and bulging with heavy cargo, was stuck in a tunnel. The truck had barely entered the shaft until the carriage’s top, grazing the tunnel’s ceiling, had put a sudden stop to its advance. At the scene an Afghan traffic policeman is arguing with the driver gesticulating wildly. Fortunately for us the incident occurred past the infamous 64-kilometer long Kabul River Gorge, and we avoid the tunnel, taking a road less traveled by. On top of the rock into which the tunnel had been carved in 1962 by the West German government, a lonely member of the Afghan National Police armed with an AK-47 peeks out from behind a guard post protected by sandbags and barbed wire observing the traffic—a token of the more lethal responsibilities of law enforcement in the fractious hinterlands of Afghanistan. Risks abound here: Taliban insurgents taking potshots at cars, roadside bombs (especially the first 26 kilometers of Highway 1 have seen repeated IED and suicide attacks), kidnappings, and perhaps the most constant and random danger—reckless Afghan drivers, who believe that the laws of physics neither apply to them nor to their cars hurtling over the narrow road that zigzags across rugged terrain through the Afghan provinces of Kabul, Laghman and Nangarhar. The two-lane highway, which cuts through the Koh-e-Paghman Moutains to the east of Kabul, is just broad enough for two cars to pass each other. This does not prevent Afghan drivers from performing daring passing maneuvers in wild chicken games decided by a few inches and seconds. The total number of traffic accidents is difficult to ascertain, but on average around 200 people are killed per year and several thousand injured—death on the highway is an almost daily occurrence. Haulage trucks are a particular danger. “They cannot move fast; if they are climbing one of the gorge’s thousand-foot hills, they cannot move at all. They get stuck. They fall back. They fall over,” as Dexter Filkins noted in a 2010 New York Times report on Highway 1. 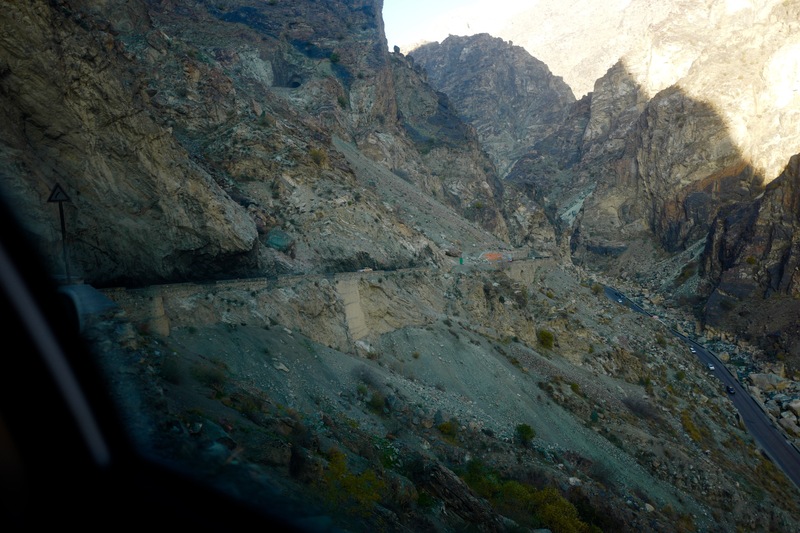 The most visually stunning—as well as the most dangerous—passage of the drive is the 64 kilometer-long section through the Kabul River Gorge with the narrow serpentine road sharply ascending to heights of up to 600 meters. 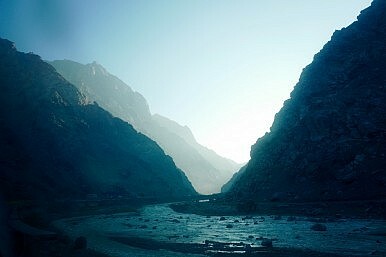 At times this gorge resembles more a long crevasse than a valley with its narrow confines and steep cliff-like drops of up to 300 meters straight to the valley floor. A meter away a ledge barely a half-meter high is the sole barrier to the abutting abyss. 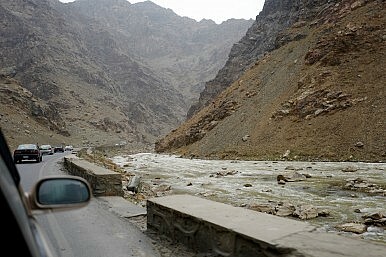 Despite these dangers, hundreds of cars and trucks make the trip from Kabul to Jalalabad everyday. 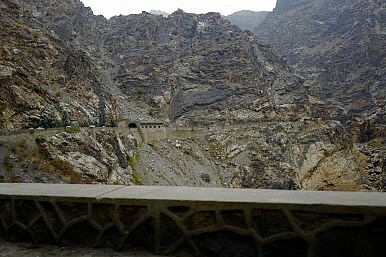 It still is one of the most important trade routes in Afghanistan. During the height of the U.S. military presence in Afghanistan every week over 2,000 trucks were hauling supplies—unloaded in the Pakistani port of Karachi—via the Khyber Pass into the country. Normal life continues along the highway. For example, the little town of Surobi, the capital of Surobi district, a hotbed of Taliban activity in the region and the site of vicious fighting between the French Foreign Legion and insurgents in 2009, is buzzing with activity: street vendors are selling everything from pomegranates and sugar canes to building materials and colorful textiles; young men are cleaning battered taxi cabs from Pakistan (recognizable by the steering wheels located on the right side) with water hoses; numerous rest stops offering food and drink are filled with weary travellers enjoying a short break. To maintain security, the highway, which cuts through Taliban-dominated territory, is dotted with small outposts manned by the Afghan National Army and Afghan National Police to deter insurgents from seizing parts of the road. However, this has not stemmed the growing sense of insecurity, despite the Afghan National Army launching a major operation to secure the highway in September 2015. Recently, Afghan local media reported that kidnappings and attacks have increased. 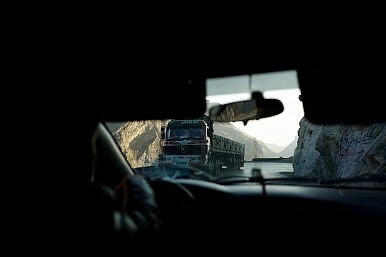 “Shootings on Kabul-Jalalabad and Laghman highway occur on a daily basis. Firings and attacks by armed groups on security check points have increased and this is very unfortunate,” a local Afghan politician told Tolo News. “Gun shots are heard here on a daily basis. They [insurgents] do not care whether they are firing on security personnel or ordinary people,” an Afghan traveller lamented. Most Westerners traveling the highway maintain a low profile, riding in old Toyotas rather than SUVs and donning local garb. Close inspection would hardly fool wary eyes, but when sitting in the backseat of a rusty Celica crossing a busy bazaar, disguise is thin comfort to anxious outsiders. Very few, however, make the trip anymore. During our drive down Highway 1 near the Kabul River Gorge, on the southern slopes of the mountain to our right, scores of men appeared spread out in a long line. I was told that they were a work crew clearing an old Soviet era minefield. They were collecting the remnants of a war that ended more than two decades ago amidst an ongoing one. As I surveyed the labors of men, I couldn’t help wondering whether they might also find the musket of an old British Enfield or even the bronze spearhead from a javelineer of the army of Alexander. There can be no victory over the insurgency unless narcotics are brought into the war agenda in Afghanistan.